Global war-mongers are seemingly in deep frustration. Despite huge investments in ‘people opposition movement’, disinformation campaign and eventual direct foreign intervention in Libya, the ‘anti-Gaddafi project’ has come to obvious deadlock. That looks quite surprising. Regular Libyan army beats the ‘rebels’ despite three weeks of constant NATO bombardments and heavy losses in aviation and field artillery which cut the Libyan military potential to 20-25% of the original. When at the very beginning of April the weather conditions deteriorated hampering air-strikes, the rebels immediately addressed Gaddafi seeking for the ceasefire. Being a smart man, coronel understands that the West will not let him win. At the same time he is not going to negotiate his own destiny at the expense of his people. So the main agenda of the intense on-going talks by Gaddafi’s envoys in Athens, Malta and London must be a face-saving solution for politicians and pocket-filling solution for their masters. ‘At our meeting in London we agreed on the candidate of official representative from Libya. We confirm that we actively cooperate with the government of France through our Council and thank you for your support in protecting Libya. We also inform that our official representative to your government and the governments of other Western countries will be Mr. Mahmoud El-Shamam instead of Mr. Mahmoud Jibril. We got to know that Mahmoud Jibril has betrayed us to Coronel Gaddafi and this caused a great damage to our movement. We are acting in accordance with the agreement with the French government reached at the conference in London on recognition of our Council as the official Libyan government. Our official representative Mahmoud El-Shamam will sign a document guaranteeing transfer of 35% of the Libyan oil reserves to French companies. We also require military support, weapons and munitions delivery as stated in our list. The list of weapons and munitions has already been sent for Your perusal. We ask you to make the decision ASAP as the army of coronel Gaddafi already controls almost all Libyan territory, and we are still holding only Benghazi. The last thing we would like to speculate on is whether this letter is authentic or fake. Wikileaks has given us a new standard for documentation leakage that will not be exceeded for a long run. Most important is that this letter has APPEARED in the Web. In our crazy today’s world, where the Reality means nothing and mainstream media CREATE virtual ‘reality’ by mounting news, this appearance means that the anti-Gaddafi mission has failed. When starting the operation, its masterminds were perfectly aware of the difficulty to get the Coronel. They needed a political clown believing in his mission of ‘liberator’ to write off probable collapse. Besides concluding naïve ‘deals’ with hollow Libyan opposition (35%-bribe to France is a fact anyway), president Sarkozy e.g. 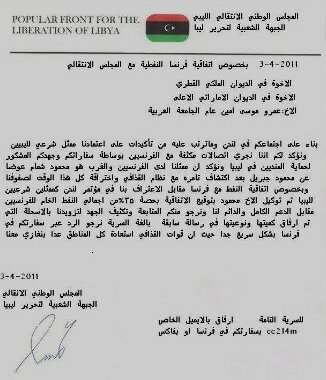 allowed the information about Gaddafi’s sponsorship of his presidential campaign depicting utmost cynicism of the international politics to leak into press. He just got into a trap set by smarter international players. Soon the French people and the whole world will forget about him. In a few days the agreement between Coronel Gaddafi and global elites will be reached. He will guarantee a good share of Libyan hydrocarbon revenues to be invested into the US treasuries. The US dollar will feel safe for some more time. Thus the 2011 season of ‘Arabic revolutions’ will be over. So what are the logical consequences of this crisis? First, we can faithfully conclude that the efforts by global elites to dismantle the Yalta system of international law will be increasing further. The core conflict between the universal principle of justice and selfish ambitions by international oligarchy to build a worldwide neo-totalitarian state is unresolved and essentially cannot be resolved. These ambitions can only be kept deep inside the cozy chairs of fashionable offices of the Wall Street by a deterrent power. Any politician demonized by the international mainstream media is a deterrent of today. Second, Al-Qaeda (pseudo-Islamic anti-national counter-progressive ideology being imposed on Islamic street) was chosen by global elites as a false ‘deterrent’ that would surrender Muslim world to the banker’s rule. The creation of this phenomenon by the British banker’s circles since XVIII century should be a matter of honest international investigation. We have already touched the matter in our previous editorial. The quality of indoctrinated and drugged ‘human capital’ fighting against Gaddafi in Libya we could assess watching news in recent weeks. Is this rabble going to win the world for Islam? Don’t make us laugh. Third, any responsible and reasonable authority got the lesson that the possession of nuclear weapons is the only tangible mean to defend sovereignty of the nation in contemporary world. We are sure Coronel Gaddafi has deeply regretted he suspended his nuclear program in 2004. At the same time, we can’t exclude a horrific provocation like a new 9/11-style nuclear attack on the US territory with an ‘evident Libyan trace’ in near future. That would be a simple low-cost solution for the ‘Dollar Problem’ as well. At least the ‘leakages’ about ‘Gaddafi’s secret smugglings of centrifuges for uranium enrichment’ were appearing sometimes in the post-2004 period. So the global Zugzwang may last long, but not forever. Historical logic dictates an outbreak because the critical tail-spin of the winged democracy will inevitably end by collision with the ground. There could be only a miracle if a talented political pilot managed to make a soft landing of the Western craft in geopolitical reality. A good analysis, I must say. Today’s wars are mostly won by Hasbara (propaganda). The imaginary ‘Muslim Al-Qaeda’ is a major part of Hasbara.